for your loved one in McAllen. At the Caring Senior Service of McAllen, we understand that deciding on long term care for yourself or an aging loved one is not an easy decision. Making the right choice requires some research into the different options available to you. To help we have provided a brief description of the most common options available as well as a few facts about home care. Nursing homes offer skilled nursing care given by a registered nurse and include medical monitoring and treatments. Skilled care also includes services provided by specially trained professionals, such as physical, occupational, and respiratory therapists. A nursing home facility may be a good choice for people who require 24-hour medical care and supervision. Assisted living facilities offer housing alternative for older adults who may need help with dressing, bathing, eating, and toileting, but do not require the intensive medical and nursing care provided in nursing homes. The operative word at any independent living community is “independent.” For the most part, residents are active seniors who are ambulatory and are able to complete all of the activities of daily living without assistance. Non-medical home care focuses on helping seniors with the daily activities they need to engage in to remain safe, healthy, and at home. 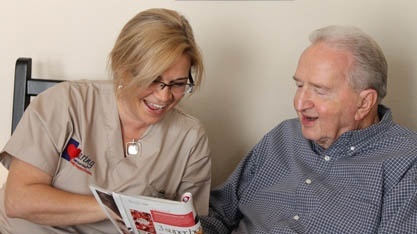 In addition to assisting with daily activities non medical homecare offers one on one companionship. A well placed caregiver can help a senior continue participating in their favorite activities such as gardening, baking or woodworking. For a more detailed list of our services, click on our services page above. According to an AARP survey almost 90% of people over 50 want to stay in their homes as long as possible. More than 80% of individuals who need long-term care receive it in their home. Caring Senior Service believes every senior should be able to remain healthy, happy, and at home.